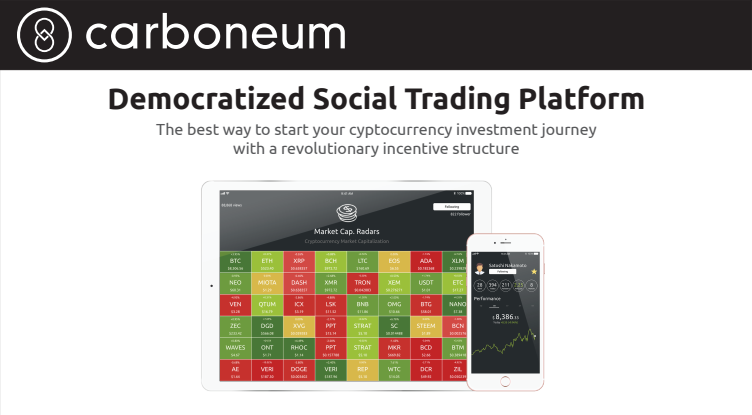 Carboneum is creating a decentralized social trading platform, named CoinRadars. Carboneum is an openly distributed protocol owned by every single user. Where traditional social trading platform helps solve complexity problem, it still lacks transparency and remains vulnerable to single point of failure risk. The platform will be completely immune to such problems. It is built to sustain and scale with a sound revenue model where perfect alignment of interests is structured. On CoinRadars, Ethereum is implemented primarily on the fundamental point of relationship in social trading mechanism, helping the system to identify and obligate one user to another, or in specific, a follower to a leader, via smart contracts. It also gives permission for the platform to standardize rules, penalty and settlement practice through such on-chain technology. We aim to create a trading and investment platform for digital assets and cryptocurrencies which authorizes the greatest degree of knowledge sharing, promotes the purest form of transparency whereby all trading activities and actions are recorded and become totally traceable, verifiable and auditable via utilization of blockchain technology. And most importantly, we are extremely determined to build a tool that helps simplify the trading decision for newcomers, who by and large are not as technologically and technically educated, compared to those industry veterans, by implementing the concepts of social trading/copy trading. First of all, you must comprehend the fact that using Carboneum is straightforward. Making a revenue using C8 is extremely straightforward and less complicated. You can make a profit with every positive trade. When you make a yielding trade, you are bound to get a return on investment. The success returns can be grabbed with every trade you make. Individuals are given a special token known as the Carboneum Token alias C8. This token can be used on digital assets. Of course, the token is not limited to social trading features. In the next few years, the uses of C8 is bound to increase. It will have utilities that can be used with many premium services. This means you will have deals and discounts on a variety of fees. What problems will Carboneum solve? As mentioned earlier, complexity of trading will be the major problem solved by Carboneum. It is true that digital assets and crypto currencies have introduced a large number of investment opportunities. However, we need to understand the basics of them to go ahead and invest in them. Otherwise, there is a high possibility for us to end up losing our money. This problem will be solved by Carboneum. Even if you don’t have any previous experience with trading, Carboneum will help you to end up with positive results with trading via their technological platform. Your life will be simplified when investing money and you don’t need to worry about anything. Hence, this can be considered as one of the most convenient methods available for a person to get into crypto currency investments. If you take a look at a centralized trading platform, you will not be able to find any transparency at all in it. But that’s not the case with Carboneum. It provides full transparency to you and you will be able to see what’s happening. You know what’s exactly happening for the money that you have invested on the platform. Due to this reason, you will be provided with the opportunity to keep peace of mind during the investments. Another benefit associated with Carboneum is that it doesn’t expose the trading platform to a single point of failure risk. This is not the case with centralized trading platforms. In fact, they are more vulnerable towards the single point of failure risk. That has been mitigated effectively by the developers of Carboneum. Hence, you will get the opportunity to minimize the risks while you are trading. C8 token is ERC20 smart contract which allows follower to pay their leader and be used in other activities on CoinRadars platform. It is our intention to gradually reduce the number of C8 by using our profit to repurchase and terminate them over time. Entering the second year after its launch, 20 percent of our net profit will be used to repurchase C8. In third year, we will do this semi-annually. And from fourth year onward, C8 will be repurchased and burnt on the Ethereum blockchain on a quarterly basis until half of C8 coin is repurchased, leaving 100 million C8 coins in the open market. All repurchasing effort will be recorded on the blockchain. It is defined as a service which enables any users to take a role of follower, giving the green light to them to duplicate the transactions of a leading trader. The greatest achievement social trading brought to this world is allowing new investors to simply take a shortcut and deem the need to educate themselves about financial product unnecessary. 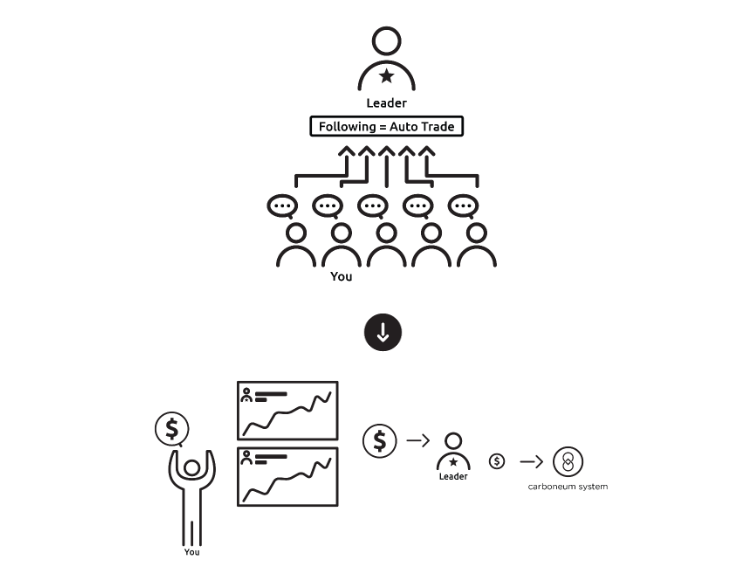 Social trading or copy trading is a service which enables any users to choose expert trader to follow, establishing a “follower & leader” type of relationship, based on the expected returns and risk preferences, and delegate the authority to execute copied trade orders automatically to Carboneum via ECR20 smart contract system. In the event that users generate positive results from any trade copied from the leaders, users will be charged a certain percentage-base amount of fee by the system. The system will then transfer the majority of that fee to the leader as a mark-up for their service, with the remaining amount being kept as platform’s revenue.